Global business aviation players are making their mark at the MEBAA Show this week, at DWC, Airshow Site, which runs until Thursday, December 8. With some 460 exhibitors in the purpose-built hall and static display area, this year's Middle East and North Africa Business Aviation Association event plays host to truly global exhibitors, with first time attendees from Asia, and nearly a third of exhibitors (27 per cent) hailing from the USA this year. Excitement was high on the first day of the event, which saw 45 aircraft on static display, and a lengthy royal tour from His Highness Sheikh Ahmed bin Saeed Al Maktoum, President of the Dubai Civil Aviation Authority, Chairman of Dubai Airports, and Chief Executive and Chairman of Emirates Airline & Group. Boeing Business Jets took advantage of the perfect audience to announce the sale of its first BBJ MAX 7 to an undisclosed customer based in the Asia Pacific region. “The BBJ MAX 7 is an exceptional business jet and we know our customers will be thrilled with the airplane,” said David Longridge, president, Boeing Business Jets, who added that the aircraft will be available in 2022. He said the Max 7 is the aircraft the company has wanted to launch for 20 years. “But we wanted to ensure the Max 7 not only had the increased range, but could operate with a 'real world' interior.” He said technically, it has taken this long to produce the aircraft which offers greater range without compromise on interior – in fact, the Max 7 is 6ft 4in longer than other BBJs, allowing more living space on board. A number of other firsts on day one included first-time exhibitor GI Aviation's announcement of receiving its Air Operator's Certificate (AOC) from the UAE General Civil Aviation Authority, enabling the start of commercial flights with its fleet of Swiss-made Pilatus PC-12NG aircraft. GI Aviation's General Manager Marios Belidis told visitors his company is delighted to pioneer a convenient and efficient method of flying for the region, promising an 'exemplary' charter service for the existing charter market and the first/business class traveller, with its 6-8 seater single turbo-prop aircraft. 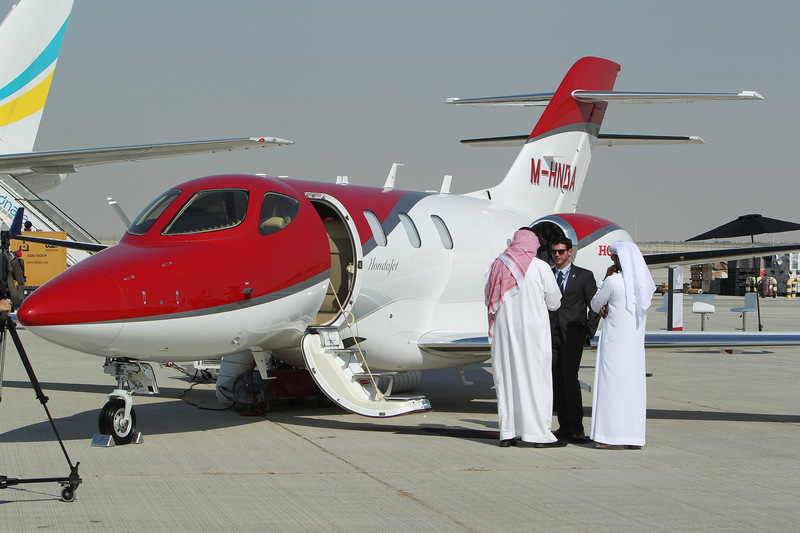 Honda Aircraft chose the MEBAA Show to debut its new HA-420 light jet in the region, featuring a unique over-the-wing engine mount configuration. Honda Aircraft president and CEO Michimasa Fujino told media the company's presence at the event is designed to engage with prospective clients, examine market opportunities and to help identify a regional representative for sales and maintenance of the $4.85 million jet. Middle East Airlines (MEA) confirmed its purchase of a second Embraer Legacy 500 business jet for its private-jet affiliate, Cedar Executive. The second aircraft is expected to enter into service in mid-2017. Cedar Executive, based at Rafic Hariri International Airport, Beirut, started operations with a brand-new Legacy 500, delivered in January 2016. Cedar Executive offers private jet charter travel for customers, along with FBO services. China's Deer Jet announced the finalisation of its acquisition of major shares in UAS International Trip Support (UAS). UAS is now flight support partner for Deer Jet's 90 strong aircraft fleet, including the world's only BBJ 787 in VVIP configuration, the so-called 'Dream Jet'. Omar Hosari, UAS Co-owner/founder and CEO, said the deal is designed to increase both companies' influence in the international aviation sector. “Our clients can now expect a broadened range of services delivered to the same levels of efficiency, quality and operational excellence they have come to expect from us,” he said.